Back on My Feet in the City of Brotherly Love | Buoy. “Back on My Feet (BoMF) is a national for-purpose organization that uses running to help those experiencing homelessness change the way they see themselves so they can make real change in their lives that results in employment and independent living. The organization’s mission is not to create runners within the homeless population, but to use running to create self-sufficiency in the lives of those experiencing homelessness. The program’s success is measured by how many Members obtain independence through employment, job training and housing. “Anne Mahlum, was 26 years old and living in Philadelphia, she was at a crossroads in her life. For the past several months, the idea of her purpose had been all consuming – she was willing to do anything to find it, she just didn’t know where to look. Soon she realized it was right beneath her feet. To learn about chapters around the country click here and to learn specifically about the Philadelphia chapter click here. 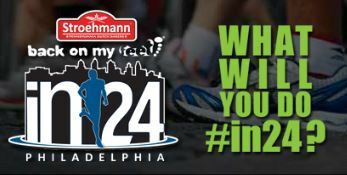 THIS WEEKEND: Registration is now open for Back on My Feet’s signature event, The Stroehmann Back on My Feet in24 Philadelphia Race Challenge! in24 Philadelphia will take place July 18th & 19th and offers four races to choose from: Urban Ultra, Relay Challenge, Midnight Madness and Justice for All 5K.